Houston Astros first baseman Yuli Gurriel has been suspended for the first five games of next season after making a racist gesture aimed at Los Angeles Dodgers pitcher Yu Darvish in Game 3 of the World Series. USA Today's Bob Nightengale first reported Gurriel's suspension. MLB Commissioner Rob Manfred cited four reasons for not wanting to suspend Gurriel during the World Series, including not wanting to punish the other players on the Astros roster by having a starter sit out, per Anthony Castrovince of MLB.com. Manfred did say there was "no place in our game" for what Gurriel did. Before MLB decided on Gurriel's punishment, ESPN's Buster Olney noted it would be difficult to suspend him for any games in the World Series due to the way the appeals process is set up. Gurriel homered off Darvish in the second inning of Houston's 5-3 win on Friday. After returning to the dugout, television cameras showed Gurriel pulling down on the corners of his eyes. He apologized for the incident following the game. "I did not mean it to be offensive at any point," Gurriel said, per ESPN's Scott Lauber. "Quite the opposite. I have always had a lot of respect [for Japanese people]. ... I've never had anything against Darvish. For me, he's always been one of the best pitchers. I never had any luck against him. If I offended him, I apologize. It was not my intention." Per Gabe Lacques and Jorge L. Ortiz of USA Today, Gurriel also admitted using the Spanish term "Chinito," which translates to "little Chinese guy," in the dugout. A Cuba native, Gurriel played 15 seasons in the Cuban National Series and Japan Central League from 2001-16. 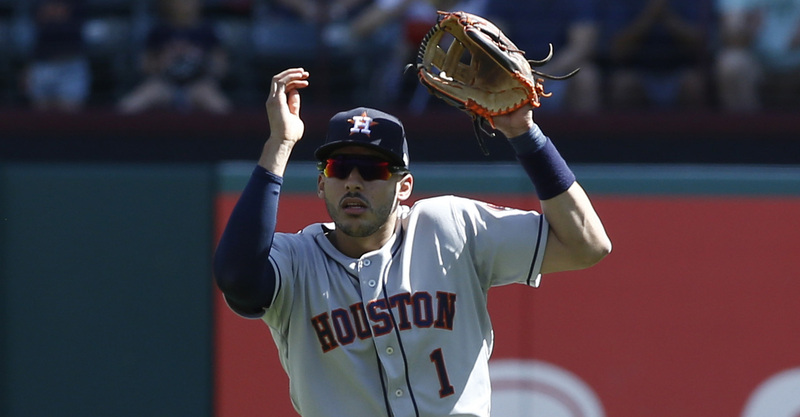 He signed a five-year deal with the Astros in July 2016 and appeared in 36 games last season. In his first full MLB season in 2017, the 33-year-old hit .299/.332/.486 with 18 home runs in 139 games.